Extracting the trapped oil into the pores is still a massive challenging. In this work, multiwalled carbon nanotubes were utilized to investigate the influence of the nanofluid’s flow rate on the oil recovery in enhanced oil recovery (EOR) stage. At the optimum conditions, comparative study was conducted to figure out the impact of EM waves on the recovery efficiency. The experimental study proved that 2 mL/min is the optimum flow rate for the utilized fluid. EM waves could enhance the recovered oil in EOR stage by 24.5% ROIP. The increment was ascribed to the extraordinary role of EM waves in increasing the viscosity of the nanofluid. 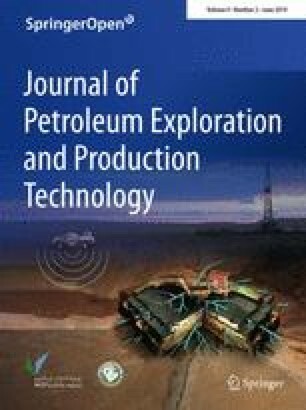 With the increase in the demand of crude oil and reduction in oil sources, extracting additional oil is becoming more challenging (Alnarabiji et al. 2014a, b, 2016, 2018; Shafie et al. 2014; Ahmed et al. 2018; Adil et al. 2018). Lately, nanosized materials have attracted wide attention due to their extraordinary characteristics (Ameen et al. 2019; Ghanem et al. 2018; Al-Swai et al. 2018; Alnarabiji et al. 2017, 2018; Ali et al. 2018; Chuah et al. 2016; Alqasem et al. 2017). Multiwalled carbon nanotube (MWCNT) as a type of nanomaterials has been implanted in enhanced oil recovery (EOR) and achieved remarkably high recovery (Alnarabiji et al. 2016). 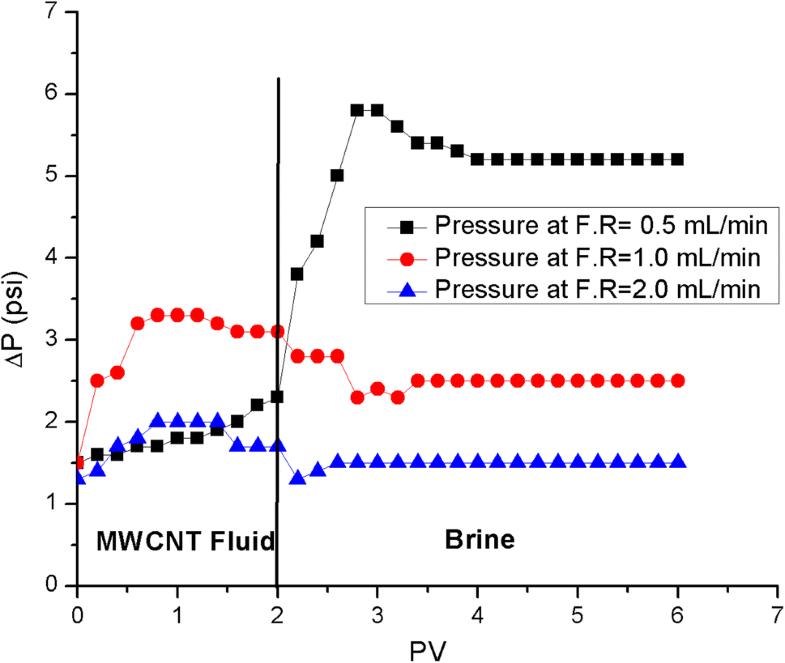 However, the previous study covered the influence of MWCNT concentration in the fluid on the recovery efficiency, whereas other parameters such as nanofluid flow rate as well as the effect of the electromagnetic (EM) waves on the recovery efficiency were not investigated. In this work, the influence of the nanofluid’s flow rate on the oil recovery in EOR stage was investigated. At the optimum conditions, comparative study was conducted to figure out the impact of EM waves on the recovery efficiency. Since MWCNT (obtained from Cambridge, UK) is in powder form, it was suspended in distilled water in order to be injected into a porous medium. The suspended MWCNT was subjected to two main stages. In the first stage, MWCNT was dispersed in distilled water as a base fluid and stirred for 15 min using magnetic stirrer on hotplate, whereas in the second stage agitation conducted to the prepared suspension in an ultrasonic bath for approximately 2 min at room temperature to enhance the homogenous dispersion of the powder in the base fluid. Similar experimental setup in our previous study (Alnarabiji et al. 2018) was utilized to conduct this study. In the current study, study with varying the flow rate was conducted in order to figure out its influence on the hydrophobic MWCNT and observe the behavior of this material in the prepared porous medium and investigate its impact on nanofluid mobility and recovery efficiency. Practically, three different water flooding experiments were performed independently to investigate the impact of the three selected flow rates of nanofluid (0.05, 1.0, 2.0 mL/min) of 0.01 wt% on fluid mobility and the recovery efficiency. The optimum flow rate was selected by observing both recovery efficiency and fluid mobility via calculating the residual resistance factor (Rrf) using Eq. (1) (Shi et al. 2010). where Ka is the obtained permeability of the porous medium before injecting the nanofluid, Kb is the resulted permeability of the porous medium after injecting the nanofluid, ΔP1 is the variation in the pressure at EOR stage, whereas ΔP2 is the difference in the calculated pressure before EOR stage. Noteworthy, If Rrf value is higher than one, this ascribes that the utilized nanofluid causes blocking to the channels and pores. The selected experiment of optimum flow rate in the absence of EM energy was considered as a reference experiment. Subsequently, the incremental recovery occurred from this experiment was considered as a baseline in the following experiment. The EM waves with 13.0 MHz square alternating current frequency was irradiated onto the studied porous medium in the EOR stage. The recovery efficiency and Rrf were computed and compared with the one in the absence of EM energy. Hence, Darcy’s equation was utilized to offer a better understanding of the recovery mechanism. It can be shown in Fig. 1 that the highest flow rate (F.R) of 2.0 mL/min gave the highest recovery efficiency 36.6% ROIP, while the rest of flow rates 0.5 and 1.0 mL/min gave 28.9 and 29.2% ROIP, respectively. The calculated mobility reduction factors for different flow rates (Fig. 2) are in good agreement with the recovery efficiency (Fig. 1). 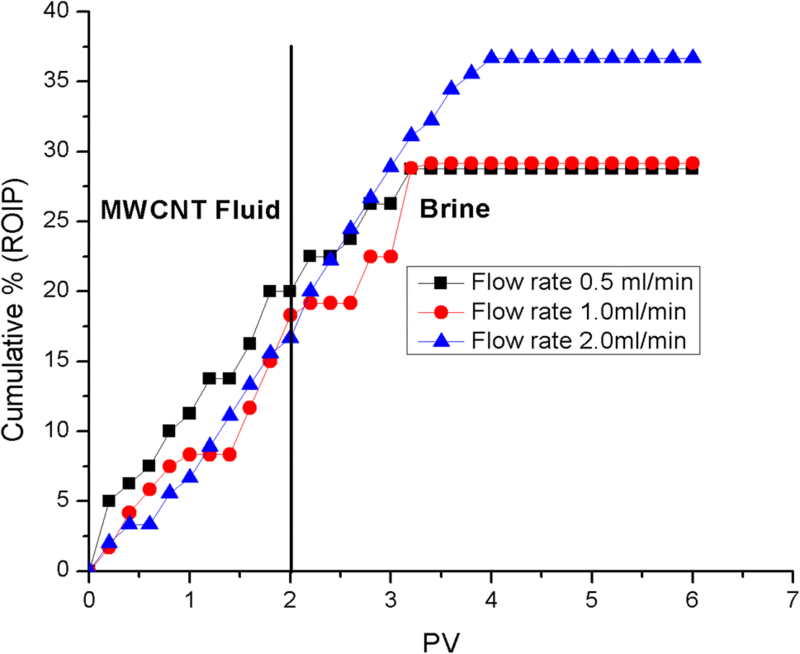 It can be concluded from the experimental results that the recovery of the MWCNT fluid increases with an increase in flow rate, which subsequently leads to an increase in capillary number and reduces the chance of MWCNT blocking the pore throat and channels. It is demonstrated in Fig. 3 that the recovery efficiency of 61.1% ROIP was achieved by using MWCNT fluid in the presence of EM waves, while in the absence of EM waves it was only 36.6% ROIP. It can also be seen from Fig. 4 that the mobility reduction factor increased from 1.2 in the absence EM waves to 1.7 in the presence of EM waves. As long as flow rate, permeability, length and the cross-sectional area where the flow occurs are constant, the increase in pressure is attributed to the increase in the fluid’s viscosity. There are two main sources behind this increase in viscosity: Firstly, inducing the MWCNT by EM waves which increased the apparent viscosity. Since carbon nanotubes possess dielectric properties (Javey et al. 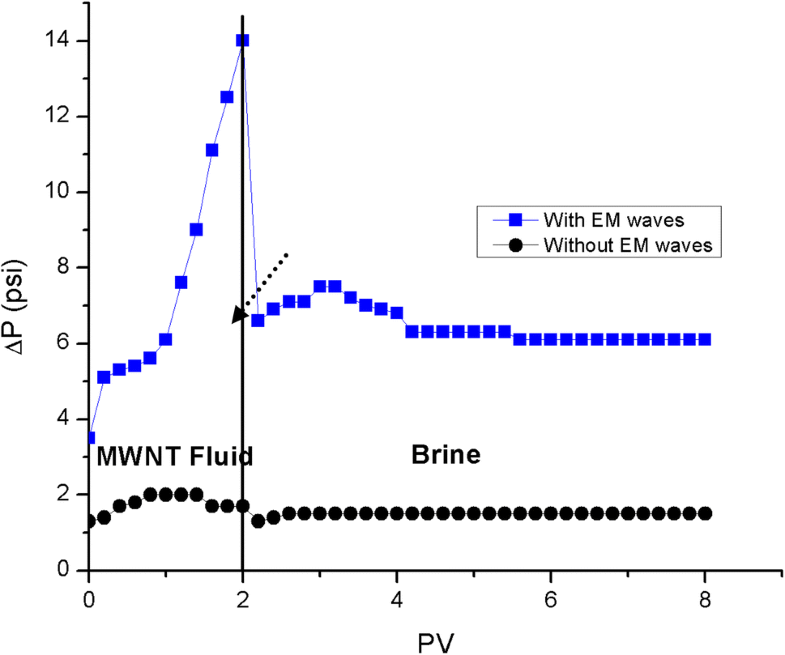 2002), the increment in the viscosity of the MWCNT fluid can be ascribed to the creation of negative and positive charges due to the polarization on the surface of MWCNT under EM waves. These electric dipoles will rearrange and align to create temporary chain-like structure which causes an increase in the viscosity of MWCNT fluid (Hao 2002), subsequently increasing the capillary number. In other words, more pressure is required to inject the fluid into the porous medium with the same flow rate (Fig. 4). Secondly, the electromagnetic waves emitted during the water flooding experiment had triggered the MWCNT in the porous medium to vibrate in a similar frequency and, therefore, form emulsion. More especially, it was found that CNT has the ability to form and stabilize Pickering emulsion. These results are in line with our previous study where EM waves assisted in enhancing the viscosity of the ZnO nanofluid (Alnarabiji et al. 2018). On the other hand, previous studies proved that CNT with hydrophobic surface nature needs mechanical energy to form the emulsion (Wang and Hobbie 2003; Shen and Resasco 2009). It can be pustulated that EM waves provide the required mechanical energy to vibrate MWCNT. By increasing the pressure of the nanofluid injection, the viscosity of the formed emulsion can be remarkably higher than that of both water and oil. This might be attributed to the fact that the created emulsion exhibited non-Newtonian behavior (Schramm 1992). It is clear from Fig. 4 that the difference in the pressure in the presence of EM waves declines directly after injecting the brine into the medium. This is because brine possesses negative and positive ions attached to the surface of charged MWCNT to neutralize. In other words, even if electric dipoles are formed and charges are created on the surface of dielectric material, their effectiveness still depends on the ionic strength of the medium. For instance, brine ions are capable of neutralizing those polarized particles directly. Therefore, the neutralized particles will not be induced by the EM waves and no more emulsion will be formed under the influence of the vibration of dielectric nanoparticles induced by the frequency of EM waves. These results are in good agreement with previous study where it was found that the salinity of brine reduces emulsion stability (Zhang et al. 2009). It is clear from Fig. 4 that with the injection of brine into the porous medium, the pressure declines drastically to 6.2 psi and then gradually increases to 6.6 psi. The reason of this increment is that the salinity of brine works on increasing nanoparticles retention in the medium (Caldelas et al. 2011). This increment reached the maximum when 1 pore volume of brine was injected after the 2 pore volume of MWCNT fluid injected (Fig. 4). Later, the blockage was released gradually by injecting more pore volumes of brine till it stabilized at the end of the experiment. 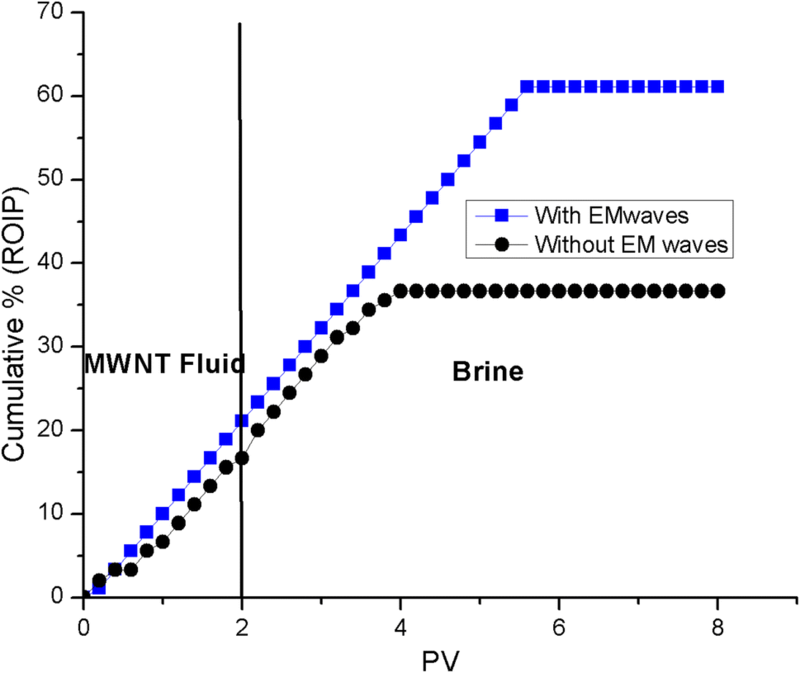 It is expected that with increasing the concentration of MWCNT fluid, more number of nanoparticles will polarize under the impact of EM waves which will drive to create higher temporary viscosity and higher capillary number; as a result, MWCNT will contribute in forming stable emulsion (Zhang et al. 2009). However, this process might have negative impact on fluid mobility and recovery efficiency as a result. Therefore, further studies required to can be conducted to investigate the most suitable nanofluid conditions under EM field. MWCNT has been utilized in EOR stage. It was found that 2 mL/min is the optimum flow rate of the prepared nanofluid. EM wave could enhance the recovery efficiency significantly where it was increased from 36.6 to 61.1% ROIP. The reason behind this increment was attributed to the increase in the MWCNT viscosity as well as the probable formation of emulsion. The authors would like to acknowledge Universiti Teknologi PETRONAS for facilitating the work and ministry of education.